As someone who regularly teaches group exercise classes, I end up eating a lot of my post-workout snacks at the gym immediately following a workout. I typically don’t have much time to spare before I need to either grab a quick shower or use some cleansing cloths to get the sweat off my face and return to the gym floor. 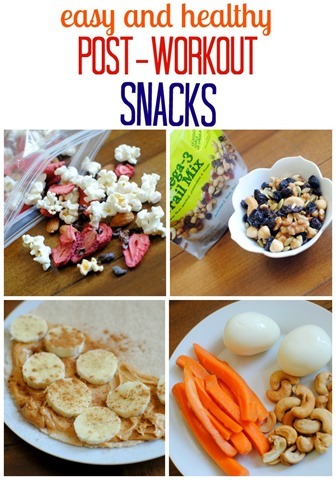 For me, simple post-workout snacks are not only preferred for the sake of convenience but also a necessity! When I’m packing up a snack to enjoy after a sweaty workout, I typically look for something that has a healthy mix of proteins, carbohydrates and fat. When a snack contains all three of these components, I feel way more satisfied than I would if I just snacked on something like an apple without the spoonful of peanut butter that I try to include because I know it will help a ton with satiety (and flavor)! Below you will find a few of my favorite easy post-workout snacks. This one is a personal favorite because the combinations you can create are endless! 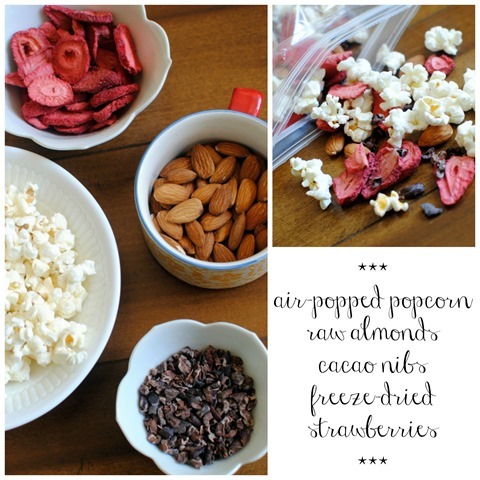 For a trail mix that incorporates whole grains, healthy fats and protein, try mixing together air-popped popcorn, nuts, cacao nibs and unsweetened freeze-dried fruit! It’s salty, sweet and filling, too! While I often use mini Tupperware containers to pack single-portions of nut butter with me, I’ll also throw a whole jar of peanut butter in my bag if I’m in a rush! Slicing an apple or pear up ahead of time (and tossing the slices in lemon juice to prevent browning) to dip into the peanut butter makes this snack a great way to sneak in a serving of fresh fruit right after a workout. Hard boiled eggs are such a great portable protein option. Real food + Delicious taste = Win, win! 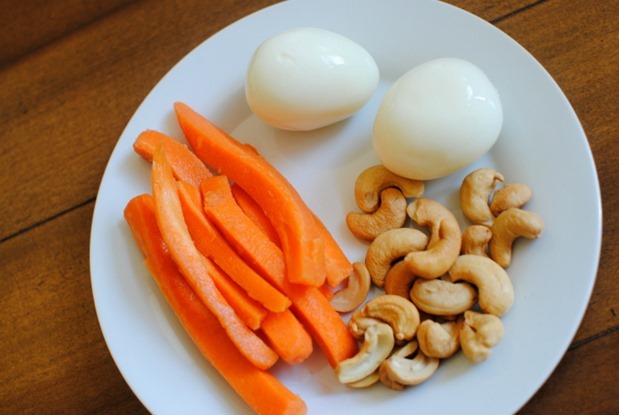 I love pairing a couple of hard boiled eggs with crunchy carrot sticks and a handful of nuts. This one works well for me because I have access to a fridge at my gym, but it’s also a great option for those who head home immediately after a workout and want something fast they can grab out of the fridge or pantry. Pop open a cup of Greek yogurt and top it with fresh or freeze-dried fruit. 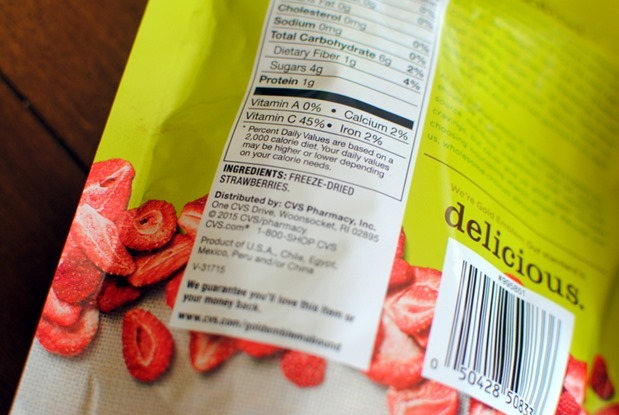 I absolutely love CVS’ freeze-dried strawberries and apples because they’re naturally sweet and crispy and add a crunchy texture to an otherwise creamy cup of Greek yogurt. Spread some peanut or almond butter on top of a whole wheat tortilla, add a few pieces of thinly sliced fruit and a sprinkle of cinnamon before rolling it up and digging in! Yum! Many of the snacks you see above include tasty grab-and-go foods from CVS’ Gold Emblem Abound line of healthy snacks. The whole product line is 100 percent free of artificial preservatives and flavors and contains zero grams of trans fats. Heck yes! I first discovered this line when Ryan and I would drive back and forth from Ocala to Jacksonville. There was a CVS located about halfway between our old house and my parents’ place and it became our go-to stop for a snack and bathroom break. I’d grab some nuts or trail mix from the Gold Emblem Abound line and liked knowing I was making a healthy choice on the road. All of the ingredients are totally recognizable and there’s a ton of variety, so whether you prefer something sweet or savory around snacktime, they’ve got you covered! 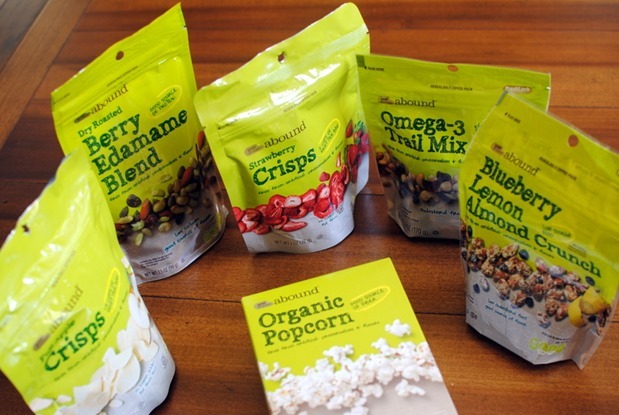 One PBF reader will win the snack pack and entering this giveaway is a breeze. 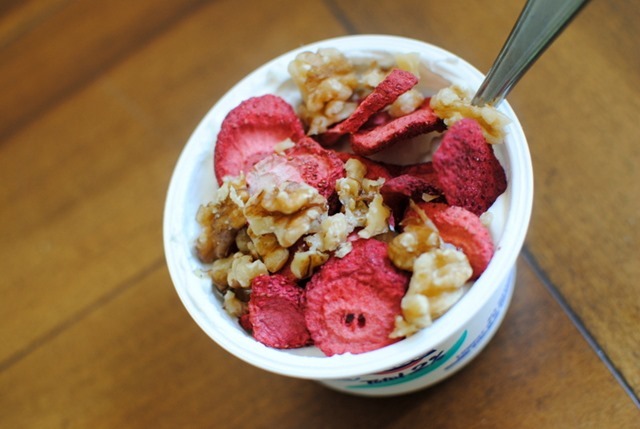 Simply leave a comment below telling me about your favorite post-workout snack. I will randomly select a winner on Friday. Disclaimer: I’m proud to partner with CVS/pharmacy as one of the “Gold Emblem Abound Trail Makers” this year! I am being sponsored by CVS/pharmacy for my Trail Makers posts and activities, but all opinions expressed are my own, and all product claims or program details shared should be verified at CVS.com or with the appropriate manufacturers. Thank you so, so much for your support. I sincerely appreciate it! U mmm a peanut butter finger? My favorite snack is an apple dipped in peanut butter. I love Greek yogurt, berries and a bit of granola on top. I love Greek yogurt with some peanut butter in it. My favorite post-workout snack is a homemade peanut butter granola energy bar. I love trail mix after workouts or really anytime of day! My favorite post workout snack is a Protein Shake! Always love knowing I get at least 20 grams of protein to build my muscles! Then, I eat my breakfast about an hour later. Pb & Banana toast is my favorite! Thanks for the chance to win! Protein shake w/ whey protein, frozen banana and blueberries, peanut butter, cocoa powder, almond milk, and chia seeds. Yum! After a run I LOVE chocolate milk! I love a banana with peanut butter! 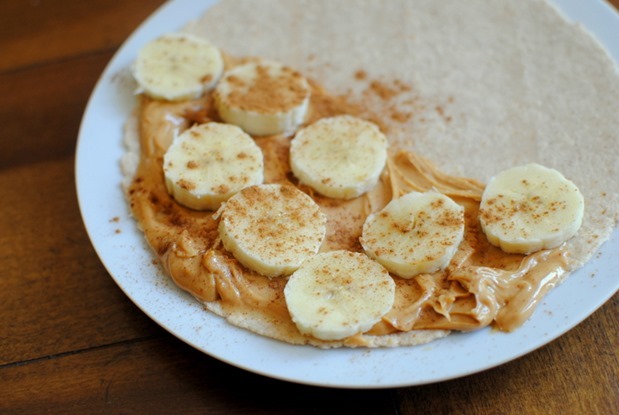 My favorite post workout snacks are a protein shake or PB/Nut butter with banana. Fruit with peanut butter is my go to snack! 2% milk and peanut butter spread on an oatmeal raisin cookie. If I’m home, I’ll make a kale smoothie with a scoop of protein powder. Otherwise, a Vega bar. My favorite post workout snack is definitely a couple of dates with some cashew butter smeared inside! Protein shake made with cashew milk. I will drink this while stretching or rolling! Great article, my winner would be Hard Boiled Eggs with Carrot Sticks and Nuts. My go-to post workout snack is almost always a smoothie! Post workout I love a protein-smoothie- but I have to try your tips! 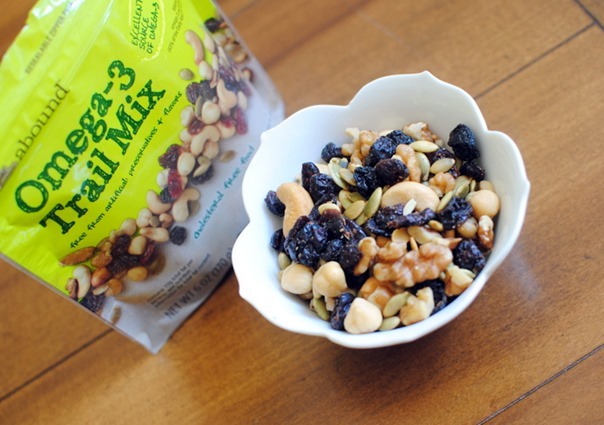 Trailmix sounds good…. My go-ts are a protein shake or a peanut butter cookie Larabar – quick and easy. I love peanut butter toast or with some crackers. Smoothies are my fave in the warmer months! I love me a good banana or some apples and peanut butter. My go to for sure! 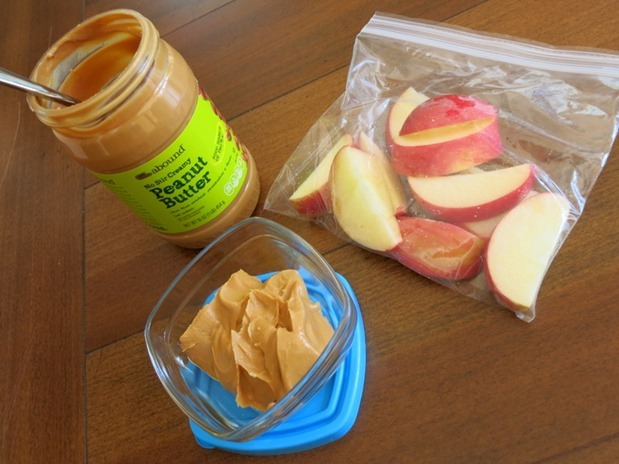 My favorite post-workout snack is an apple with peanut butter! For something very fast, milk! Icy cold. I like frozen Greek yogurt slightly defrosted. I feel so boring – I usually just have a plant-based protein shake. But that popcorn/strawberry/cacao nib/almond combo is making me drool…will be trying that super soon!